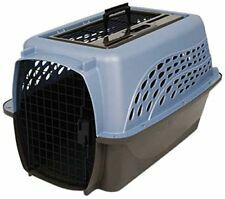 Features of the Petmate 2-Door Top Load Kennel, Blue, 24" L X 16.8" W X 14.5" H. Petmate kennels are eco-friendly. Two-door dog kennel with easy pet access. Superior ventilation and visibility. Great tool for crate training and housetraining. This kit includes Cut-to-fit, absorbent kennel pad. Once the item leaves the US, it is yours. 2 - "Live Animal" stickers.